In this comment read Kimberley’s story of how here mum saved everything for good and at 83 is still doing it. What a shame. Rebecca B.A.R. made some good points in this comment in relation to heirloom clutter as did GreyQueen in this comment. There were many more great comments than this but I have been so busy this week preparing everything for my medical time out that I haven’t had as much time to dedicate to my blog. Sorry folks. Here is a cute organisational project from Martha Stewart that Cindy thought we might enjoy. It looks so gorgeous anyone would be inspired to file on a regular basis. This link is a little bit of fun. It is a clutter symptom checker ~ a check list to decide which areas of your home have a clutter problem. Declutter something that was given to you by someone else. If you no longer want or need it offer it back to the person who gave it to you, sell or donate it. You don’t have to keep things just because they came from someone else. I might seem a little repetitive on this advice but that is because people get very stuck on keeping this kind of stuff. 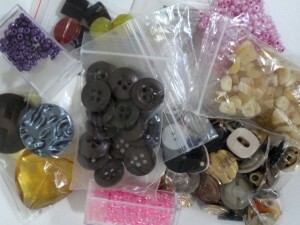 This collection of beads and buttons that I donated to the craft shop fit with today’s mini mission. Some of them were given to me by my mother and my mother-in-law. I have had them for a few years but not used them yet so time to move them on. Lots of good stuff here. Two more items on the sale list. Two collectible dolls that were gifts to each of us from the other. We should have never bought them in the first place. What do we need with two dolls we have to them find a place to display? Duh! We weren’t thinking that’s for sure. oh I just love the mini office. If I wouldnt have a really well running filing system already and if I would own a wooden chest, I would so go for it! Especially the pinboard. I love that you were crazy busy in the same week that I was. The other roommate is almost completely out, and I can’t wait to get everything back in order. Some of it already looks much nicer, but we have a couch where the desk goes, and a desk where the dining table goes… even still though, it’s neater than it was when she was here. I have a donation pile going for my stuff, and it’s getting to a good size finally. Next up will be moving everything back into its place, and seeing what doesn’t have one. I can’t wait! Colleen, you keep me inspired to not just be organized, but also to keep everything to a minimum, even if it means getting rid of something that I used to love. I’m so happy with everything all neat and clean. The chest is really cute. I have one about half that size that serves as my nighttable. To get my “office” into it one day in the future would be a great thing. What a good motivation for more paper/home office decluttering. I should definitely save the idea. At the moment my chest holds wrapping paper and a few (I think, at the moment it’s one?) empty boxes for shipping things. That’s not a lot for a chest of that size. Thanks so much for the mention! I noticed you posted post number “669”, which was the submarine I was on was back when I was in the Navy. My wife and I have begun to put together our boxes of items for donation this week, so this is a timely topic. Haven’t posted for a while, but I have generally been reading. Ive just been very fatigued and a bit overwhelmed with other things. Our home has been getting a bit grubby – I am so hopeless at housework: I find my routines are always thrown by poor health and then it takes ages to get back into any sort of routine again. But yesterday I bought several packs of the microfibre clothes you highly recommend Colleen as part of my attempts to get back on track. I was very impressed with the way they cleaned the bathroom sink and taps. Our lodger of 2 years leaves us soon: she has very much been a momento clutter collector and a floordrobe user. So I have been astonished and very impressed that she has in the last 2 weeks got rid of 80% of what she had in her room as she doesn’t want to cart it back home (as her mum is very anti clutter,lol) and is ready to start over her new life. I have had to resist the kitchen ‘stuff’ freebies on offer. Hope the op has gone smoothly Colleen.